Yes, sometimes breakfast gets a little extra indulgent and borders on dessert. 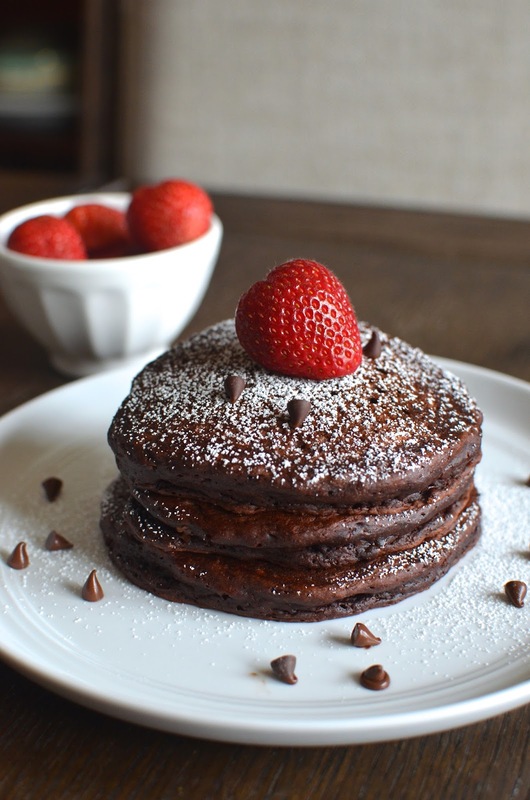 I can think of no better excuse (though who needs one) to indulge than Valentine's Day so the weekend beforehand, we did just that as I served up these chocolate pancakes for breakfast. These chocolate pancakes are made with buttermilk - tender, fluffy, and light, chock full of chocolate flavor from cocoa powder as well as mini chocolate chips that I folded into the batter. I substituted some of the all-purpose flour with white whole wheat flour and I think these pancakes can really handle it. In fact, I think chocolate and whole wheat flour work really well together in general, often giving the finished product a subtle nutty flavor and texture. It's a little like eating a light and fluffy chocolate cake. Think of it as an alternative to chocolate muffins. I'd like to think I showed some restraint in not topping the pancakes with chocolate sauce like you often see. As tempting as that may be, some berries and a few extra sprinkles of mini chocolate chips does the trick. Looking at these pancakes is helping me deal with Valentine's Day withdrawals. I hope you had a lovely one, filled with love and plenty of chocolate! Lucky for me, there's Chinese New Year to continue the celebrations and the feasting on sweets. I can't complain at all! It's almost Valentine's Day! I love this little holiday because I adore all the hearts, the pink & red, the treats, the chocolate, and symbols of love. We can all use more expressions of love and we can all appreciate a little sweet treat! I've been in the Valentine spirit and trying to spread a little of it through food. These cookies are an example of that. 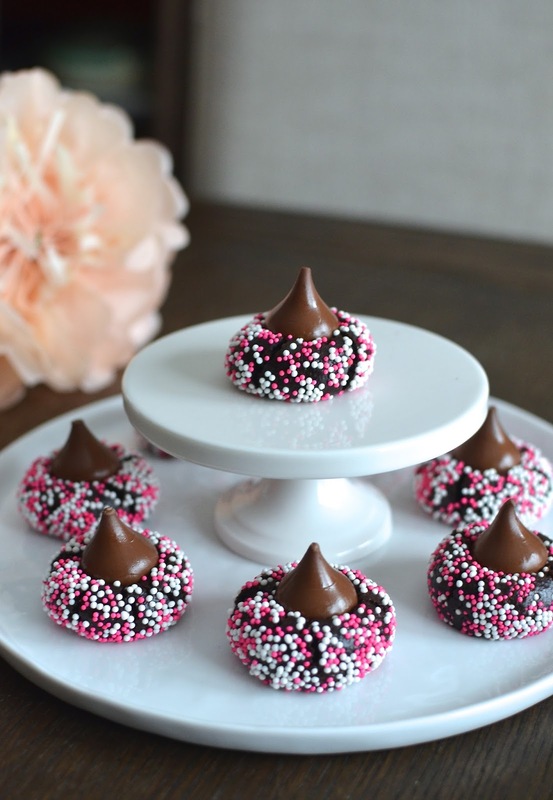 I'm calling them "Valentine Kisses" - essentially, they're soft chocolate cookies with a Hershey's Kiss on top. I first saw this recipe as rainbow kiss cookies from Sally of Sally's Baking Addiction; I spotted them around Christmas and the colorful nonpareil sprinkles caught my eye and I haven't stopped thinking about them. Since I didn't get a chance to make them over Christmas, I thought I'd make them as a Valentine treat, and simply swapped the rainbow nonpareil sprinkles with pink-and-white ones. You can easily customize these cookies for any holiday/occasion. Sprinkles are versatile and always, always smile-inducing! These cookies are not only fun to look at but really tasty. They are soft and a little fudgy inside, packed with plenty of deep chocolate flavor. The little chocolate Kiss on top makes the cookies what they are (and they are so cute to look at) but they're frankly equally good without it. 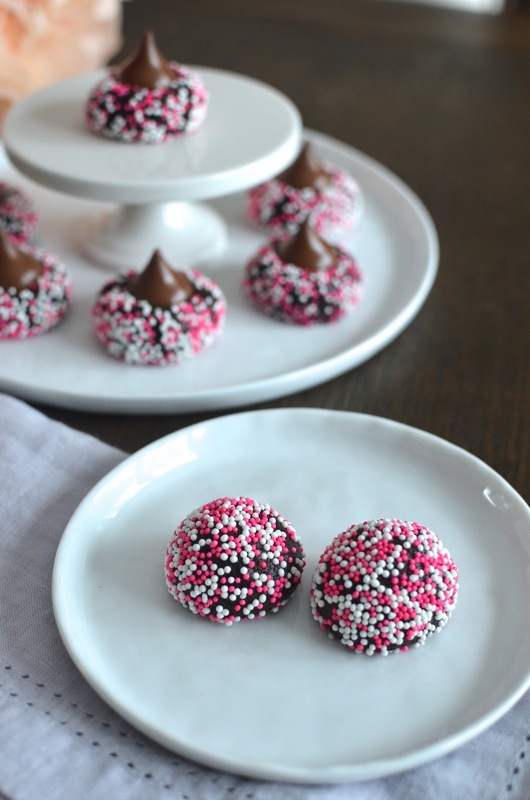 You'd just have to rename them from "kisses" to "bon bons" or something. I could not resist making them in their original rainbow version as well. They really make me smile! 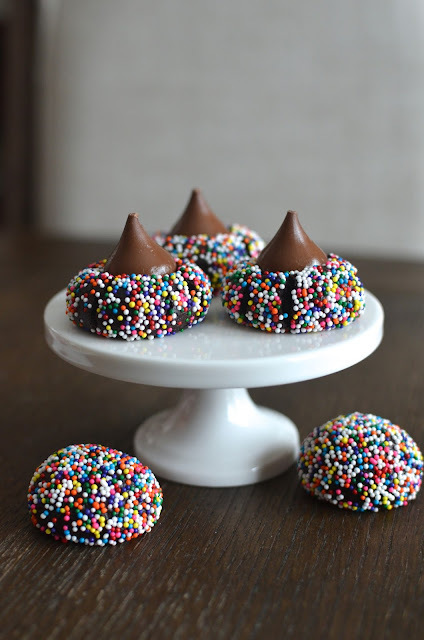 Whatever sprinkles you roll these kiss cookies in, I think they're bound to make you smile and remind you of the joy of chocolate (not that anyone needs a reminder of that)!